"The Bear Hunt You've Always Wanted!" Eastern Sky Guiding Service now offers Saskatchewan Black Bear hunting. With years of extensive personal black bear hunting experience, we will make sure your successful Bear Hunt turns into a memory that lasts a lifetime! Richard and daughter pose with bear after a sucsessful hunt. Eastern Sky Guiding Services is a family run business. Consisting of Richard Geres (Owner/Operator), his wife Marla and their 3 daughters, Carlie, Taylor and McKenna. All 3 girls have harvested 400lb bears at the age of 12. 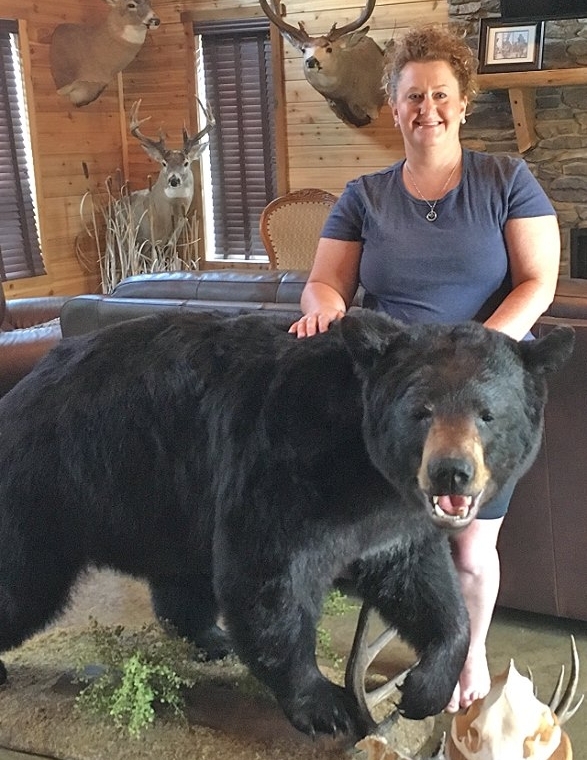 In 2013, Marla harvested a 510lb, 21 11/16th black bear, winning her numerous awards. As for Richard, he has harvested a 500lb bear, scoring just under 20”. Our 18 non-resident & resident allocation tags are in prime country, located along the North West and North East side of Duck Mountains Provincial Forest. With 15 bear sites and numerous trail cameras, our clients on arrival will be able to view pictures and set some hunting goals. Whether your goal is head size, weight, colour phase, rifle or archery. Eastern Sky will be able to guide you towards them. All bear sites are baited, baiting begins as early in the spring as the law and weather permits. We hunt out of single or double tree stands. All sites have trail cameras, so we will know exactly what each are producing and how active each site is. Average shot with a bow will be 15-30 yards, with rifle being no more than 100 yards. Average bears are 300lbs, it is not uncommon to have 400lb bear coming in. Then there are the dream bears, that are 500lbs plus and approximately 30% of the total bears will be a different colour than black. Hunts can be booked in the spring or fall. Spring hunts will be early May until the end of June. Fall hunts are late Aug until late Sept.
You will have 5 days of hunting. Each guide will be paired with 3 hunters. Richard and Marla both guide, so 6 hunters can hunt at once. •Trophy care (skinned and hide frozen) If you choose to take the hide home with you, all risks and additional luggage costs are your responsibility. ◾A non-refundable deposit of 50% per hunter is required to secure your spot, we will honour another hunter to fill your spot, if you find one. ◾Final payment is due prior to or upon arrival. Book Your Canadian Bear Hunt Today! •Your choice of weapon and a soft case, to transfer the weapon from home to your stand. (No pistols in Canada). • Extra clothes, warm and cool. • If you are hunting with a rifle, you must have a white or orange suit with an orange hat. • If you are hunting with a archery, crossbow, muzzle-loader or shotgun you can wear camouflage clothing. • Insect suit or head net as well as insect repellent, thermal cell. • Tall, waterproof hiking boots or rubber boots. • Flashlight, headlamp is ideal. • Snacks for your hunting stand. • Camera and lots of memory/storage. Flight arrangements should be made so that you can arrive at either Regina, Sask. Airport or Winnipeg, Man. Airport. We are approximately 2.5 hours from Regina and 3.5 hours from Winnipeg. A rental vehicle will be needed. Over night accommodations are the responsibility of the hunter, there are several hotels close to the airports that provide shuttle service. Before travelling to Canada with your gun, we recommend you fill out the Non-Resident Firearm Declaration Form. As well as create a Hunting and Trapping License (H.A.L. Account) if you don’t have one.